This January NEMT was contacted with regards to the 14 Cairns that had been built under the auspices of Ballater Royal Deeside. BRD (who can avoid the acronyms these days!) is a Ballater based Community Group with a handsome website www.royal-deeside.co.uk. 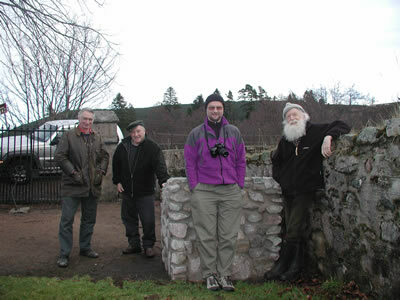 Adam Watson at cairn in Glen Muick Kirkyard. plinths which are to give information about each of the locations in which they are located. BRD had called this project "History with Boots on" - the name apparently being chosen as there does appear to be some connection with Boots the Chemist. In theory the project is sound enough however the problems kicked in when it came to the practice. Unfortunately BRD, in their race to get the job done and dusted, omitted to carry out a few vital first steps. These include lack of full and proper public consultation plus the omission of an application for the required "advertising consent" from the Aberdeenshire Council Planning Authority – despite apparent promises to their funders that all necessary planning conditions had been met. It was also noted that local stone was not used and to be honest in many cases the cairns themselves did look roughly built with regards to foundations, abandoned spoil and cracks appearing even in the first season. A strongly worded letter high-lighting our concerns was written to Mr Stuart Carrie, Development Control Manager of Aberdeenshire Council Planning and Environment Services Department in Stonehaven. This can be seen on our NEMT website and it does go into a more detail regarding our concerns. Hamish Porter, Planning Inspector (Marr) did reply stating that a re-submission of planning application was submitted. Yes, one was launched post the voicing of local concern but this was withdrawn before the Cairngorms National Park Authority could view it – as yes, they did intend to call the application in. 14 separate applications (one for each cairn) have now been submitted to the Aberdeenshire Council and the Cairngorm National Park has called them. Besides any thing else this event constitutes a real mile stone in the development (and of the meaning!) of the new Cairngorms National Park. NEMT has resubmitted our letter of concern directly to the new CNP Office in Ballater and we await with interest to see what happens. Will the Cairngorms National Park Authority have the final say on what does and does not happen. If retrospective planning permission is granted – what conditions will be attached? Whatever else, this cairns episode is a statutory lesson on the importance not going ahead with ideas without going through the proper channels. If the will of the local folk together with their wealth of knowledge, that only they can have about their local area, can be built on we will all be so much the richer.